The effective use of electronic data interchange (EDI) is the key to better healthcare supply chain management. In healthcare supply chain management (SCM), EDI primarily focuses on the electronic exchange of business transactions such as purchase orders, shipment authorizations, shipment acknowledgements, advanced shipment notices, or invoices. EDI provides a fast, secure, and easy exchange of information between healthcare organizations. Most of the hospitals in Europe are focusing on deploying a full suite of electronic processes with automated methods to track the complete process of purchase order purchase order acknowledgement, invoice creation/matching, and processing to the accounts payable system. Most of the hospitals in Europe procure supplies from wholesalers. The adoption of EDI for these transactions has grown significantly over the past few years in most European countries as it helps reduce the procurement cost and time, enhance budgetary control, curb management errors, increase production capability, improve information management, reform payment procedure, strengthen seller-buyer relationship, and lower the price by standardizing the processes. The European healthcare EDI market is growing at a fast pace. 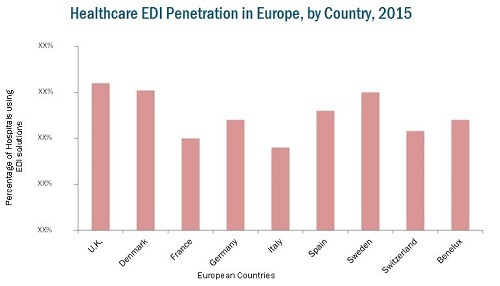 Europe is one of the major markets for the use of EDI in healthcare supply chain. Pharmaceutical wholesalers were early adopters of EDI in Europe, and currently process nearly 92%–95% of their orders through EDI. Due to growing competition and decreasing profit margins, pharmaceutical companies and medical device manufacturers in Europe are under increasing pressure to implement EDI systems that help them cut operating costs and remain competitive and profitable. ORDERS, DESADV, and INVOIC are the most preferred EDI transaction types for supply chain management in hospitals across Europe. In 2015, ORDERS was the most preferred transaction type, followed by INVOIC, among European countries. In terms of volume, in 2015, approximately 51.2 million purchase orders were generated by hospitals in Germany through EDI. Over the last few years, the adoption of EDI among healthcare providers, suppliers, and purchasing organizations in Europe has witnessed substantial growth. Growing competitiveness, rising adoption of mobile EDI, pricing pressure, and lower profit margins are driving greater uptake of EDI solutions among pharmaceutical companies and medical device manufacturers in Europe. However, high cost of EDI implementation, inadequate infrastructure, and lack of technical know-how pose several challenges to the overall growth of the market. The geographic scope of this study covers countries/regions, namely, the Benelux, Denmark, France, Germany, Italy, Spain, Sweden, Switzerland, and the U.K.
EDI is increasingly being adopted in the European healthcare industry; this market is expected to register significant growth due to greater uptake of EDI solutions among pharmaceuticals and medical device companies owing to various advantages such as reduction in the administration costs, reduced errors, pricing pressure, and lower profit margins. Moreover, the increasing number of government initiatives toward the implementation of IT in the healthcare industry is estimated to propel the demand for healthcare IT solutions, which in turn will drive the healthcare EDI market. However, high cost of EDI implementation, challenges in management of EDI, security concerns of the data and restricted investments in healthcare EDI by hospitals present challenges to the overall growth of the market. The increasing use of EDI in healthcare manufacturing & distribution industry and gradual acceptance of mobile EDI are the major trends in the European healthcare EDI market. In this report, the European healthcare EDI market is segmented based on type of transaction, type of purchasing organization, and region. ORDERS was the most preferred transaction type, followed by INVOIC in European healthcare system. In terms of volume, in 2015, approximately 51.2 million purchase orders were generated by hospitals in Germany through EDI. The increasing number of hospitals in Europe adopting EDI solutions especially in supply chain management due reduced errors enabling operational benefits, less errors, faster transaction processing, and various government initiatives are the key factors contributing to the growth of healthcare EDI market in Europe. Geographically, the European healthcare EDI market is analyzed at the country level, comprising Benelux, Denmark, France, Germany, Italy, Spain, Sweden, Switzerland, and the U.K. Germany, France, Denmark, Sweden are expected to witness a high penetration rate for healthcare EDI in coming years owing to the rising geriatric population, increasing government funding and initiatives, improving healthcare infrastructure, increasing demand for quality healthcare at low costs, and presence of major companies in these regions. Bayer AG, Pfizer Inc., GlaxoSmithKline PLC, and Abbott Laboratories are the EDI technology leaders in the pharmaceutical and manufacturing sector in Europe. 6.3.5 Eli Lily & Co.